What Would Mike Do? 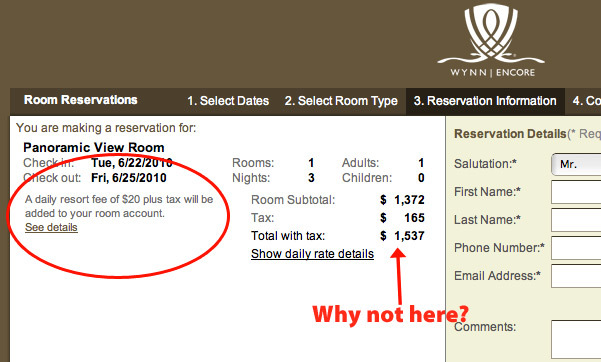 : The hotel blog: Why do high-end hotels insist on charging for Wi-Fi service or "resort fees"? Resort fees allow a property to advertise one price, then add on an additional charge for whatever the 'resort fee' is supposed to cover. (Here we go with that FreeCreditReport.com 'savings club' again: what is that 'resort fee' supposed to cover?) It's like advertising a new car at an astoundingly low price, but only including wheels and an engine as an extra-cost option. Or adding on the full bells-and-whistles options package without first consulting the customer, hoping he'll sign on the dotted line rather than insist that he didn't order, and doesn't want, the car loaded with options and isn't willing to pay the extra cost. Business or government travelers with a reimbursable expense account will frequently let a wi-fi charge slide rather than get into an argument over it: it's not coming out of their pockets. The only rationale I've ever heard for charging for wi-fi that makes any sense at all is limited bandwith - if every guest in a large hotel fires up a laptop and goes online at once, it'll cause a degradation in signal that'll slow everyone's internet connection down. But this is a problem that's easily and cheaply overcome, with adequate routers. Meanwhile, even the local $49.99 a night Econo Lodge offers free wi-fi. What does that tell you about the scarcity of bandwidth? You'll never see one of our hotels doing it.